Ambassador Hotel Waikiki is an ideally-located Oahu Hotel, and many top Honolulu events take place nearby. Oahu Hotels like Ambassador Hotel Waikiki are preparing to welcome the performers and attendees who will come to the Island for the 22nd annual Honolulu Festival. The Honolulu Festival is a Honolulu event that has a purpose: to promote understanding and education about the people of Hawaii and the Pacific Rim. Attendees will enjoy live music, a variety of cultural performances, craft demonstrations, and more. Some of the performers at the 2016 Honolulu Festival include cheerleaders, hula dancers, singers, and many others. In all, 123 performers will delight the crowds at this event on Oahu. The theme of the 2016 Honolulu event is Cultural Harmony and the Journey to Peace. In addition to the performances and demonstrations at this free event, attendees will find lots of food vendors, hands-on crafts, and much more. Activities and performances are available that will interest all ages. While the event is free, there is no parking available at the venues. Attendees can park in the nearby Hawaii Convention Center for $10 per day. A full schedule of performances is available on the Honolulu Festival’s website. Those planning a visit to Oahu can make reservations at Ambassador Hotel Waikiki on the Oahu Hotel’s website or by calling 855.513.4392. This Oahu hotel offers 311 well-appointed guest rooms located in the heart of Waikiki and just 9 miles from Honolulu Airport. 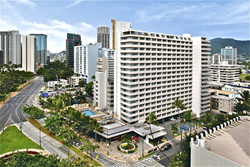 The Waikiki Hotel boasts the best rates in Waikiki, yet the location is extremely desirable. Guests who choose Ambassador Hotel Waikiki stay just steps from some of the top Honolulu attractions, Oahu shopping, and Waikiki activities. The Oahu Hotel is just a short stroll from the world-famous Waikiki Beach and from numerous Waikiki restaurants. Each Guest Room of the Oahu hotel features a Private Balcony, Flat Screen TV, and other impressive amenities. It doesn’t take long for guests to see why the guestrooms and guest suites will full kitchens are a top pick of travelers looking for the perfect Waikiki hotel! Visiting Waikiki? Choose Ambassador Hotel Waikiki - A Honolulu hotel, located in the heart of Honolulu and close to many Honolulu activities, Honolulu things to do and more. Check Rates, Make Reservations or call toll free: 855.513.4392. Take a Photo Tour of our Honolulu Hotel and Things to do in Waikiki.